Will a Breakthrough Solar Technology See the Light of Day? A startup that might have a record-breaking solar cell is in danger of going out of business. Solar needs to get far cheaper to compete with fossil fuels on a large scale. The power unit is a rectangular slab about the size of a movie theater screen. It’s mounted on a thick steel post, and equipped with a tracking mechanism that continuously points it at the sun. The slab is made of over 100,000 small lenses and an equal number of even smaller solar cells, each the size of the tip of a ballpoint pen. This contraption is part of one of the most efficient solar power devices ever made. Semprius, a startup based in Durham, North Carolina, claims that the next generation of this power unit will make solar power the cheapest option for utilities installing new power plants. With fields of over 1,000 of these devices, utilities would produce electricity at less than 5 cents per kilowatt-hour. That is even cheaper than today’s least expensive option: a new natural gas plant. The technology originated in the lab of John Rogers, a professor of chemistry and materials science and engineering at the University of Illinois. Semprius has raised $45 million from investors including Siemens, and has set records for solar-cell efficiency—meaning the amount of energy in sunlight that is converted into electricity. This year it demonstrated that it could use a version of its technology to make a novel kind of solar cell that, some believe, could convert half of the energy in sunlight into electricity, about three times better than conventional solar cells. Yet for all the promise of the technology, Semprius is in a tough financial spot. For its technology to be cost-effective, Semprius must scale up the production of its solar cells significantly. Right now it can make enough solar units to produce six megawatts of power per year, but it needs to raise that to at least 200 megawatts. The company is raising $40 million in hopes of doing this. Its current investors say they’ll contribute, and for now they’re loaning the company money to keep it in business, but they won’t do so forever. The company needs a new investor soon. Otherwise it could go under. Semprius’s predicament has become a familiar one for solar startups. Founded in 2005, Semprius was part of a wave of venture capital investments a couple of years later that funded hundreds of new solar companies (see “Alta Devices: Finding a Solar Solution”). It’s one of only a few of those companies still standing. Many of the others failed or were acquired for pennies on the dollar. Investors lost more than $1 billion. The resulting backlash has made it difficult for any solar companies, regardless of their merits, to get the investments they need to prove their technology. 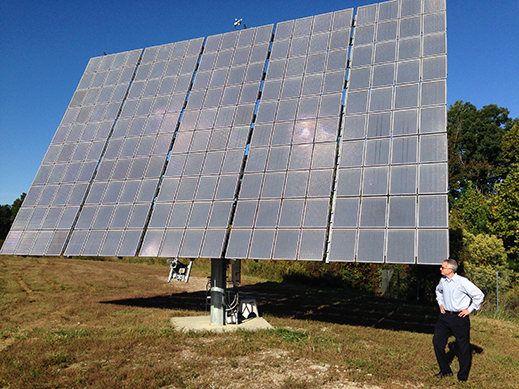 Scott Burroughs stands in front of one of Semprius’s solar power systems in Henderson, North Carolina. 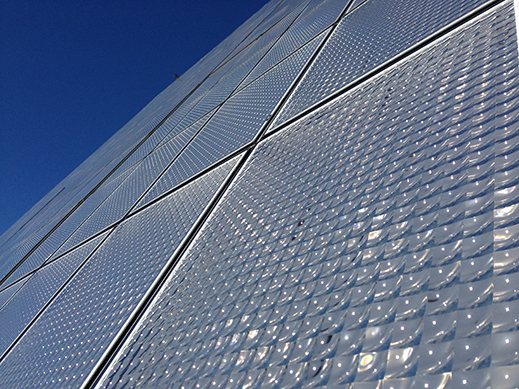 Over 100,000 small lenses focus light on powerful solar cells. An array of tiny solar cells—the tiny black dots on this wafer—were produced using a new stamping technology. The cells, now covered by small clear beads that help focus sunlight, are arranged on a circuit board. The black dot is one of the solar cells magnified by lenses that concentrate sunlight. That raises a disturbing possibility—might a breakthrough technology that could make solar power truly competitive never see the light of day, not because of any lack of technical merit, but because investors have been scared off? Semprius is not actually asking for that much money. In the heyday of the solar technology bubble, the ill-fated startup Solyndra raised about $1 billion from venture capitalists and got another half billion from the U.S. government in the form of a loan to build a large factory to prove its technology. A few years ago, Semprius would have had no trouble raising $40 million so that it could increase capacity and lower costs to the break-even point. Unlike many earlier solar startups that gambled on developing entirely new manufacturing equipment, Semprius mostly uses inexpensive, off-the-shelf equipment, some of it from the LED industry. It could grow simply by using excess capacity at existing LED manufacturing facilities. The company wouldn’t be possible without one key bit of new manufacturing technology, but that, too, is remarkably simple. At Semprius’s pilot factory in Henderson, North Carolina, that technology can be found inside two glass-enclosed devices, each not much bigger than an office copier. At the end of a robot arm, and kept deliberately out of view, is a rubber stamp embossed with a pattern. This stamp is what makes Semprius’s high-efficiency, low-cost solar power possible. 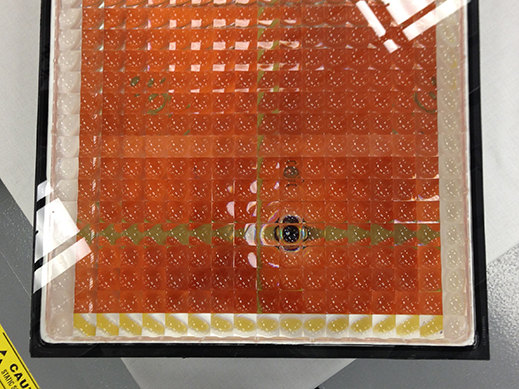 The stamp, developed in Rogers’s lab, allows Semprius to improve upon a type of solar power called concentrated photovoltaics, which has been around for decades (see “Ultra-Efficient Solar”). The idea is that you can increase the amount of energy any solar cell gathers by putting lenses over the cell to focus light into it. Existing versions of this technology might use a lens with an area of about 400 square centimeters and focus it on a one-centimeter solar cell, for a concentration ratio of 400. Semprius’s stamp makes it possible to make arrays of solar cells that are far smaller and thinner than the ones that had been used in concentrating photovoltaics. For the concentrating technology to work, the solar cells need to be picked up and arranged in an array so they can be paired with an array of lenses—and that’s where the rubber stamp comes in. It can pick up and transfer thousands of the tiny solar cells at once without breaking them, completely changing the economics of using small solar cells. Small cells have many advantages; because they require little material, they can be made of expensive types of semiconductors that are far more efficient than silicon. What’s more, they dissipate heat well and can operate under very concentrated sunlight. That makes a 1,600-to-1 concentration ratio possible rather than 400-to-1. You’d need far less material and real estate to generate the same amount of power as a typical solar cell. These advantages, and some clever lens designs, allowed Semprius to break a solar power efficiency record in 2012. But Burroughs says another advance, made this year, would allow the company to go even further. 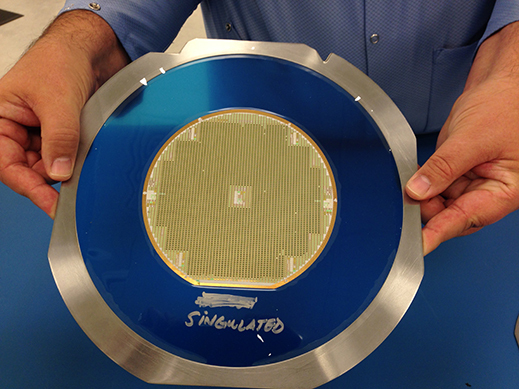 Semprius demonstrated another advantage of the rubber stamps—their ability to quickly and very accurately stack cells made of different semiconductors on top of each other. Researchers have wanted to do this for some time, since it would allow them to match semiconductor materials to each part of the solar spectrum. Some wavelengths of light would be absorbed by one material, and the rest would pass to the semiconductors below, and so on. Physically stacking cells wasn’t practical with conventional manufacturing equipment. Semprius’s rubber stamp and extremely thin layers of semiconductor make it relatively easy to align the cells and electrically connect them. Burroughs predicts that next year Semprius will break the current record, then quickly break the new one as it optimizes the technology. If the company can survive until next year, that is. The plan had been for Siemens and Semprius to work together, with Semprius producing its concentrated photovoltaic devices and Siemens drawing on its expertise in building solar power plants. But 15 months after Siemens invested in Semprius, everything fell apart. Huge investments in conventional silicon solar power, especially in China, had lowered costs of production but also flooded the market with cheap solar panels. Given the supply of cheap solar panels, it became nearly impossible for companies with alternative technologies—such as thin film solar or concentrated photovoltaics—to compete. Dozens of promising solar startups failed and the projected market for concentrated photovoltaics shrank, convincing Siemens to get out of the business, ending the partnership and marking the beginning of hard times for Semprius. Semprius’s solar devices are best suited for use in solar power plants. Having the backing of Siemens would have helped convince utilities to take a chance on novel technology. Without such a partner, that job is much harder. Making matters worse for Semprius, conventional silicon solar panels still have room to become significantly cheaper and more efficient. New ways of manufacturing silicon wafers, the most expensive part of a solar cell, could cut wafer costs in half or more (see “Praying for an Energy Miracle”). 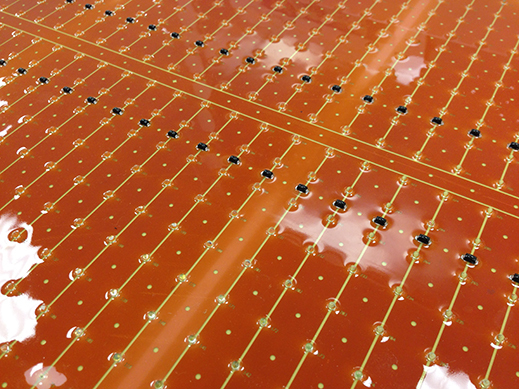 New solar cell designs are edging up their efficiencies. Such advances might eventually make solar power cheaper than fossil fuels, even without Semprius’s technology. But silicon-based solar power is not yet there, and that’s the opportunity for Semprius. The U.S. Energy Information Administration estimates that new solar power plants will produce power at just under 15 cents per kilowatt-hour—far higher than the 6.5 cents per kilowatt-hour for natural gas power. Thus, if Semprius is right that it will soon have technology to make solar panels capable of producing electricity at around 5 cents per kilowatt-hour, its technology could be attractive to those planning new power plants. “No invention is required, just good, solid engineering,” Burroughs says. So Semprius continues its search for a new investor to scale up its technology. It has leads in sunny places, where its systems work best, like Saudi Arabia and parts of Mexico. At least one potential investor in China is interested, says Burroughs.